With mail craziness going on over here, I realized I didn't post the third task for the Lovely Letters project. The third task is fairly easy with 10 things you like. It's nice though, this allows room for creativity. I've already started working on mine and have a few ideas what to add to it. Again, I'll show you a peek once I've given it enough time to reach my partner. The last task was to send ten questions to your partner. As the letters were due just around Halloween, I really wanted to incorporate something halloweenie into my next piece of mail. 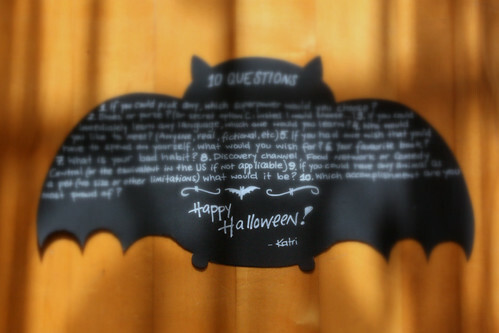 I used the same format from my regular Halloween mail and sent the questions to my parter carried by a bat. How are you letter exchanges going? I wrote the second one to my penpal way back, but haven't received the second one from her, so waiting for that. I guess task 3 will have to wait a bit. Same here! I sent mine at least with the hope for it to arrive by Halloween. I haven't received hers yet either. Oh, I just got the one from my penpal, so we're just a bit behind schedule. Now I can write the answers to her questions, and soon start working on task #3. I'm glad to hear you got your questions, I'm still waiting on mine. I guess there's just been some delays in the mail. Maybe due to the weather.